The IS-4M is a Rank V Soviet heavy tank with a battle rating of 7.7 (AB/RB/SB). It was introduced during the closed beta testing for Ground Forces before Update 1.41. Ammo racks of the IS-4M. Very good frontal armour; can even bounce 128 mm shells from the Maus. 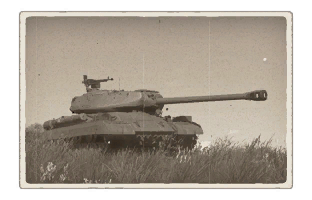 The mere presence of an IS-4 can make enemies panic or run and hide. Slightly wider choices of ammo compared to the IS-2 and IS-3. 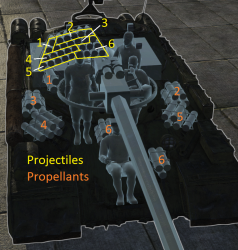 Ammo rack in back of the turret; if a shell penetrates, the ammo could detonate. During the development of the IS-3 in 1944 under General Nikolai Dukhov, a separate project was underway by a design team led by L.S. Troyanov to improve the IS-2 design. This separate project commenced under the designation Object 701. The project produced three proposed design. The Object 701-2 with a S-34 100 mm gun, 701-5 with a different armour configuration, and the 701-6 with the 122 mm D-25 gun. The 701-6 was accepted for further development, to which was modified with thicker armour, longer hull, and a more powerful engine. There was some implementation of German designs into the prototype; the engine has a cooling system that uses a pair of circular fans on the engine deck, a feature also seen on the Panther tank. Object 701 was eventually approved for production in 1947 as the IS-4. The production turned out 200 tanks (some sources say 250) before the production was halted. The reason being that the IS-4 was criticized for being inadequate in mobility despite its new engine. While production ended, the remaining IS-4 still saw service in the Soviet Union. When the Korean War broke out in 1950 and the United States and its allies got involved, the IS-4s were all shipped to the Far East of the Soviet Union in anticipation of Soviet intervention in the Korean War. They were not committed despite pressure by the Chinese from fear of inciting another world war. Even so, the IS-4 stayed in the region ready for action. In the late 1950s, the IS-4 underwent a modernization program along the lines of the IS-3 with increased ammo stowage, new machine gun armaments, new gun optics, better engine, and better filtration system and this modernized variant was named the IS-4M. The IS-4 stayed in service in the Soviet Union until the 1960s. The IS-4, as a relatively unsuccessful Soviet tank, faded to obscurity with little information on it past its development period. It was the heaviest of the Soviet heavy tanks that were slated for a production. 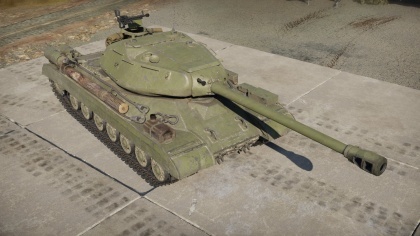 The IS-4's design was further developed on in the IS tank family with the Object 703, with the design using an electrical transmission instead of a mechanical one. This vehicle, redesignated the IS-6, also proved to be problematic and was shelved. This page was last edited on 1 April 2019, at 10:45.